GOP Candidates Laud Bachmann, Who Departs Without Endorsing A Former Rival : It's All Politics Several former rivals of Minnesota Rep. Michele Bachmann were quick to applaud the now-suspended campaign run by the only woman to have sought the 2012 Republican presidential nomination. In ending her own bid for the White House, Bachmann did not offer a specific endorsement. 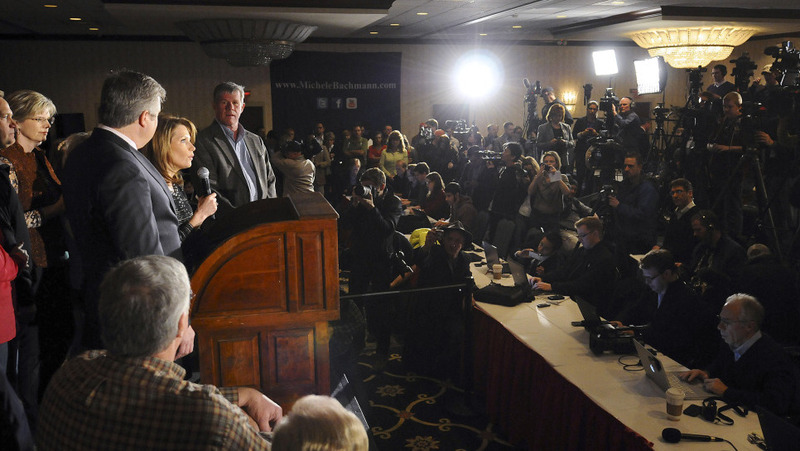 Rep. Michele Bachmann, R-Minn., announces an end to her campaign for president on Wednesday in Des Moines, Iowa. Several former rivals of Minnesota Rep. Michele Bachmann were quick to applaud the now-suspended campaign run by the only woman to have sought the 2012 Republican presidential nomination. Jon Huntsman said Bachmann added an "energetic and passionate voice" to the campaign. Mitt Romney called Bachmann a friend with a "titanium spine." And Newt Gingrich extolled Bachmann's "considerable talent" and "great courage." Bachmann finished sixth in Tuesday's Iowa's caucuses, and last among candidates who campaigned in the state, with only 5 percent of the vote. But during her campaign, Bachmann was referred to as a "cultural warrior," receiving strong support from Christian conservatives. Now, those supporters are up for grabs. In ending her campaign Wednesday, Bachmann did not offer a specific endorsement but said she would back the eventual GOP nominee. "Michele Bachmann brought an energetic and passionate voice to this race, and she should be proud of the ambitious solutions she offered to reduce our national debt and rebuild our economy," former Utah Gov. Huntsman said in a statement about an hour after Bachmann's announcement. "I wish Michele and her family nothing but the best, and know she will continue to be a powerful force in the fight to defeat Barack Obama and restore America's greatness." Minutes later, former Massachusetts Gov. Romney released a statement saying: "Ann and I salute Congresswoman Bachmann. She ran a campaign to advance the principles of limited government that I hold dear. Michele is a friend and a strong competitor. Her tenacity on the campaign trail and her fierce intelligence in the debates have left me no doubt that, as advertised, she does indeed have a titanium spine. "Michele inspires millions of Americans by the way she has lived her life, raised her family and served her country. With leaders of her caliber coming up the ranks, the future of the Republican Party – and the future of the country – is bright," Romney wrote. Gingrich was campaigning in Concord, N.H., when he discussed Bachmann and her husband, saying that he and his wife "think of them as friends." "She is a considerable talent, she has great courage," Gingrich said of Bachmann. "I agreed with many of her issues." Announcing that she was leaving the race, Bachmann told supporters in Des Moines, Iowa: "I believe that if we are going to repeal 'Obamacare,' turn our country around and take back our country, we must do so united. And I believe that we must rally around the person that our country and our party and our people select to be that standard bearer."